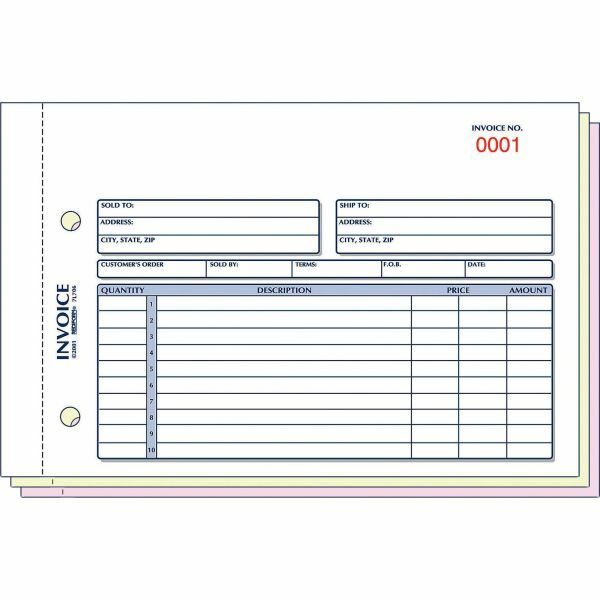 Rediform Carbonless Invoices - Carbonless invoice forms offer a space at the top for your company stamp. Forms come in a manifold book with a flexible cover. Three-part set includes a white original, yellow duplicate and pink triplicate. 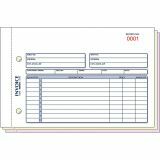 Each form is printed in blue ink with an invoice number printed in red in the top right corner. Preprinted boxes designate sold to" with address and "ship to" with a possible other address, "customer order," "sold by," and date. A chart on the bottom half of the invoice form includes space to list their quantity description and two columns for price and cost amount. Invoice forms are consecutively numbered in red. Detached size of the form is 7-7/8" x 5-1/2"."